The Libertarian Party of Orange County is hosting their July Meetup this Tuesday night, July 9, 2013, from 7 pm to 9 pm, at Karl Strauss Brewery, located at 901 South Coast Drive, in Costa Mesa. Come meet your fellow Libertarians or learn about the Libertarian Party in an informal atmosphere. We’ll be in the back patio. Every year the Libertarian Party of Orange County has a booth at the Orange International Street Fair in Orange CA. This is a great event to advocate the message of liberty to the citizens of Orange County. The fair itself is a veritable smogasbord of food, drink, music, and fun. If you’ve been to one, you know what we mean. 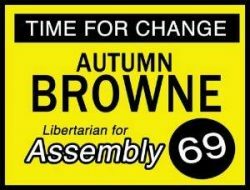 We’re looking for volunteers who can represent the Libertarian Party and the philosophy of liberty in a classy, educated, and friendly manner. We convert lots of people, open lots of eyes, and have a good time doing it. Even those who don’t agree with us, usually leave with a more positive opinion of libertarianism. We usually need volunteers who can work 4-5 hour shifts. If you want to volunteer for longer or less, that’s fine, just let us know and we will work out what we can. Any questions in general? Just let us know. We will provide drinking water and sunscreen. When you RSVP yes, please leave a message letting us know when you can attend and please also leave us a means to contact you. We need volunteers on August 30th, 31st, and September 1st for the following shifts…. Setup TBD (usually in the morning). Sticking around for teardown at the end of the last shift would be greatly appreciated!